Equipped with a standard working tube of C 530 ceramic and two fibre plugs. 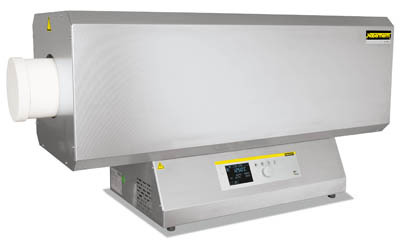 Nebertherm™ Compact Tube Furnace includes Controller B 410. Compact tube furnaces with integrated control systems can be used universally for many processes. Excellent price - performance ratio. Can also be equipped with gas supply system 1 (no vacuum operation) and gas supply system 2 (for vacuum operation). Five programs and four freely programmable ramps, controller C 450 with 10 freely adjustable programs and 20 segments, or controller P480 with 50 freely adjustable programs and 40 segments for three-zone operation. Rango de temperatura (métrico) 1200°C Max.